Designed for use with the Canon Drop-In Filter Mount Adapter EF-EOS R, this Drop-In Circular Polarizing Filter A is an intuitive and sleek means for using a polarizer in conjunction with an adapted lens, especially those lenses lacking traditional filter threads. 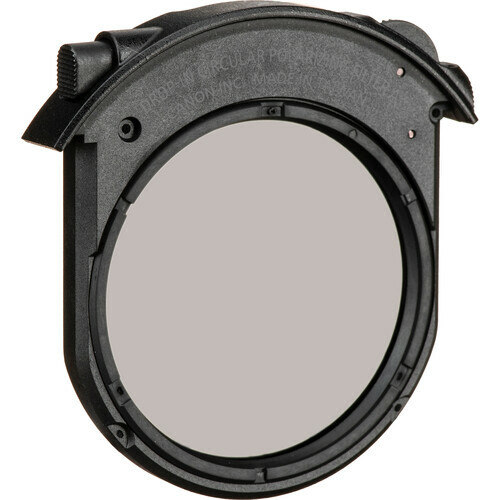 This polarizer is permanently installed within a drop-in holder and has an integrated wheel for adjusting the rotation position to alter the polarization effect. The circular polarizing filter is useful for minimizing reflections and glare, and enhances overall color and tonal saturation by filtering out light that has become polarized due to reflection from a non-metallic surface. It also helps to lessen haze in distant landscapes and increase apparent contrast. Box Dimensions (LxWxH) 3.9 x 3.9 x 1.5"
does polarizing filter reduce light? While a polarizing filters primary function is to minimize reflections and glares, it will also cut around 1-2 stops of light as well.